At the 27th International Cartography Conference in Rio de Janeiro, Brazil, the cartographic product “Occupying São Paulo – An Augmented City Map” won the third jury prize in the category maps on paper. Publisher’s Description: São Paulo, Latin-America’s largest city, is undergoing fast transformation in many respects. While the city is rapidly expanding, its historic centre is accumulating vacancy. Since 1997, urban social movements are occupying a significant number of the abundant vacant buildings as a way to simultaneously broach political deficiency and provide affordable housing. This ‘augmented’ city map seeks to re-frame São Paulo as an occupied city, to uncover the multiple logics behind vacancy and occupations, and to engage with the emergent form of radically different city making that occupations perform. 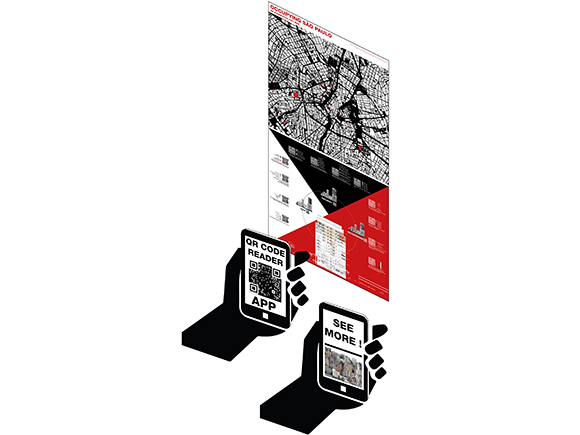 To address the complexity of this phenomenon, a conventional figure-ground of São Paulo has been enriched with second-level content, accessible through QR-code technology. Behind the QR codes incorporated in the map, you can catch a glimpse of the the occupied buildings and their inhabitants through intimate pictures and video portraits. The QR codes incorporated into the legend, on the other hand, reveal some of the multiple readings and possible interpretations of the -at first sight relatively straightforward- base map: the additional maps and diagrams, accessible through these QR codes, show among others the socio-spatial logics underpinning the emergence of building occupations, vacancy as a diversified spatial phenomenon in São Paulo’s historic centre, and some of the different ways in which building occupations are transforming life in the city.